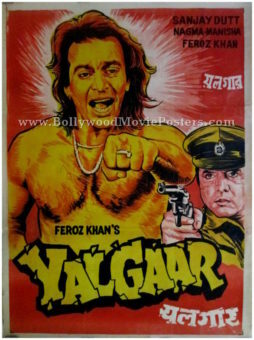 Hand drawn Bollywood poster of the Hindi film Yalgaar (1992) for sale. 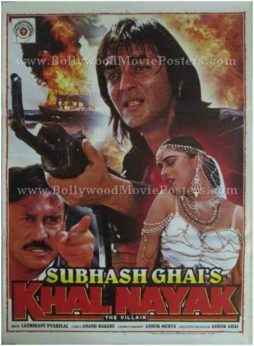 Featured here is an actual surviving old Bollywood poster for sale of the 1992 Hindi movie directed by and starring Feroz Khan along with Sanjay Dutt, Nagma, Kabir Bedi, Mukesh Khanna and Manisha Koirala in pivotal roles. Printed and circulated during the initial run of the film (somewhere in the early 1990s), this hand drawn Bollywood poster was originally designed for publicity of the film but never ended up being used. This Sanjay Dutt movie poster was originally designed in oil on canvas format by a small time art studio in Kolkata, giving it a very quirky appearance. The artwork is typical of old school Bollywood posters of the past. 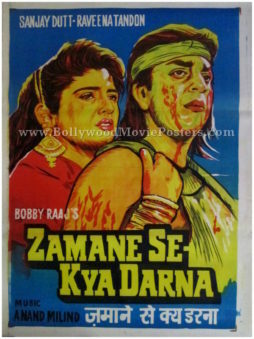 Sanjay Dutt is seen in a karate pose punching in the air in a brilliant hand draw rendition prominently in the poster. A smaller hand drawn portrait of Feroz Khan pointing a gun is seen alongside. The faces of the stars are painted in yellow, similar to “The Simpsons.” This Sanjay Dutt film poster features a stunning use of bright yellow and red shades, giving it a very eye catching appearance. Yalgaar featured a memorable soundtrack. A couple of songs from the film, “Ho Jata Hai Kaise Pyar Na Jane Koi” and “Aakhir Tumhe Aana Hai” are fondly played and remembered till today. 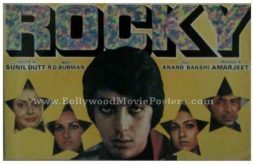 Old Bollywood pressbook of the hit Hindi film Rocky (1981) for sale. This is an actual surviving rare Bollywood old pressbook of the 1981 film that marked the Bollywood debut of Sunil Dutt’s son, Sanjay Dutt. 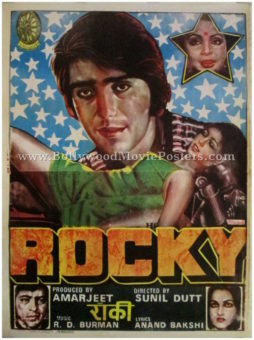 Printed and circulated during the original first release of Rocky in 1981, this rare Bollywood old pressbook was distributed to cinema audiences outside movie halls that actually screened the film. Rocky was released only four days after the death of Sunil Dutt’s wife and Sanjay Dutt’s mother, Nargis. A seat was left vacant at the premiere of the film as a befitting tribute to her.